:When a day trip out of Las Vegas with his wife takes a turn for the worse, Jack is sure that he has the ability to get them home. But he drove into something far beyond reason. Samuel Parker was born in the Michigan boondocks but was raised on a never-ending road trip through the US. Besides writing, he is a process junkie and the ex-guitarist for several metal bands you've never heard of. He lives in West Michigan with his wife and twin sons. 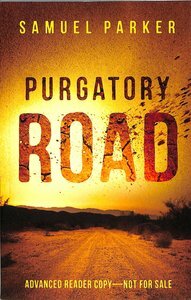 Customer Reviews For "Purgatory Road"
Just finished reading! Wow, can hardly breathe. I did find myself wondering if I wanted to keep reading because it has some very dark undertones but I'm glad I persevered. It does have mystery and suspense so if you like that kind of story then it's a great read. I apologise for the harsh title of my review but I honestly got nothing out of this book. The storyline is dry and confusing. There's no sense of satisfaction after I finished the book. Will not recommend it.